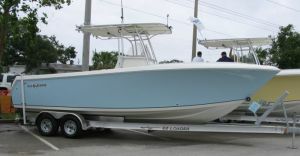 Not too long after I started Smith Marine Design in a spare bedroom of a house we were renting in Crystal River, I got a call from Paul Hoppes, the owner of Sailfish Boats. We had met a few years earlier when I worked for Sport-Craft Boats. 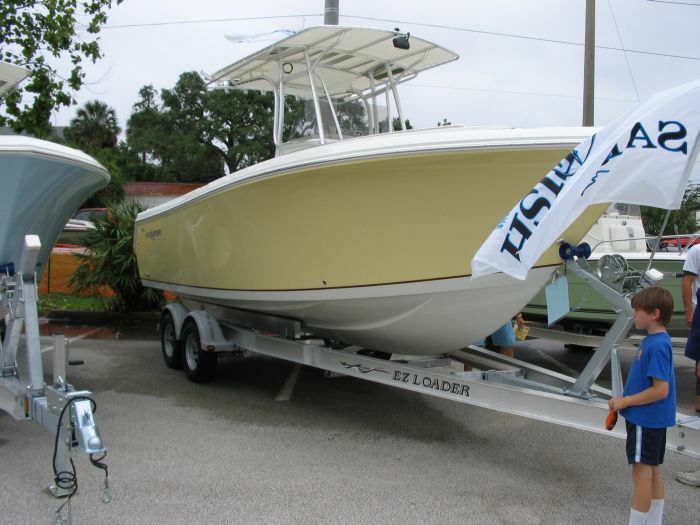 At the time, Sport-Craft was building a couple different models that we also sold to Sailfish. They would put their name on the side and market them through their dealer network. This worked for both of us at the time, giving Sailfish a couple of larger models without the expense of creating new tooling and giving Sport-Craft some much needed volume. Paul had heard through the marine industry grapevine what I was doing and called me to help him with some changes he had planned. We have been working together ever since. The Sailfish 2660 started as an update to the Sailfish 266. After taking the lines off the inside of the hull mold, I used them as a starting point for the new hull. While some of the characteristics stayed the same, such as transom deadrise, most of the hull was modified. The deck was completely new, as was just about everything else! While I did the bulk of the initial design work, Greg McLogan at Triton Design and Development provided the surface files required by the CNC routers that were used to carve the plugs. Greg also did a great deal of detail design work as the project progressed. The Sailfish 2360 is a smaller version of the Sailfish 2660. The main changes are aft of the console, where there is a little less room. (The little guy in the picture is my son Logan, who's now over 6' tall!) As on the 2660, Greg McLogan provided the surface files and a great deal of detail design work. 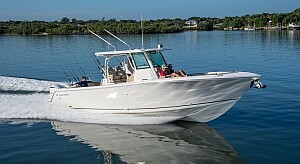 The Sailfish 3160 was a new design from a clean sheet and the largest model in the Sailfish line. 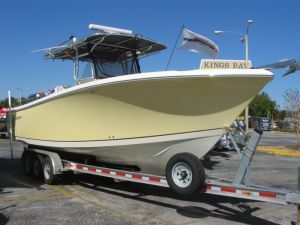 One major goal was to make this the best riding rough water boat Sailfish had ever made, so she was given more deadrise throughout her length than any previous Sailfish hull. Her strake design was also modified slightly to provide more lift and a drier ride. As with most Sailfish designs, she has a wide beam (10') and lots of freeboard. These features make her a stable and safe platform for taking the family offshore. I did the hull shape and the preliminary design work while Greg McLogan provided the deck and console design as well as the surface files. Then came the hull for the Sailfish 2860. This hull combined the advances made on the 3160 with the narrower beam of the 2660. The proportions are just about perfect and she has received glowing reviews for her ride and handling. The 2860 has become a very successful model for Sailfish over the last few years. 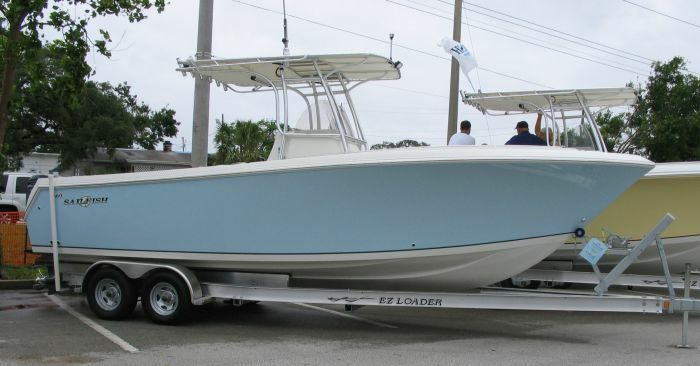 In 2015, I got to design the hull for the Sailfish 241 Center Console. This same hull also is used for the 245 Dual Console. With each version of the Sailfish longitudinally stepped hull, I make small changes to refine the ride and handling. This hull was designed for a single outboard, so she has a slightly narrower beam. 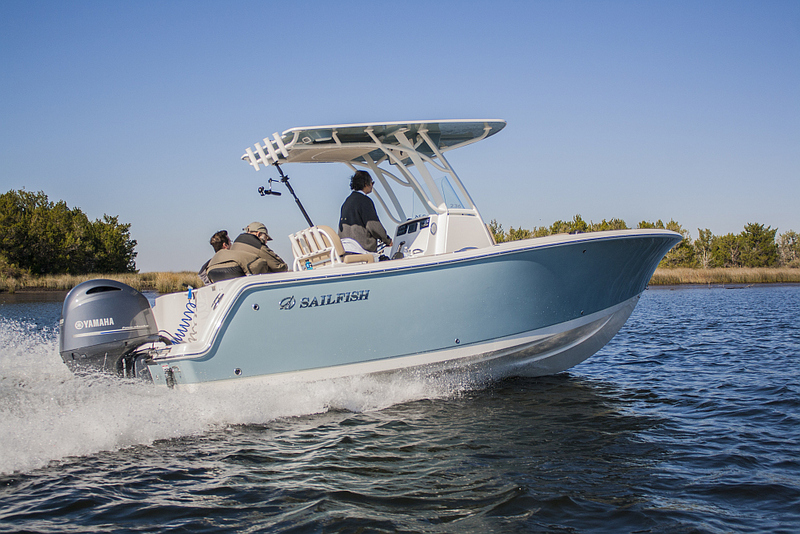 2018 saw the launch of the biggest Sailfish yet, the 360 CC. Once again I contributed the hull lines for this 3 engine beast. It was my first time designing a hull for triple engines and there were quite a few issues relating to the center engine that needed to be worked out. I must have done OK as she hit 57mph with triple Yamaha 300's. Over the years Sailfish has changed the names of some of these models. The 2660 is now the 270, the 2360 is the 242, the 3160 is the 320 and the 2860 is the 290. 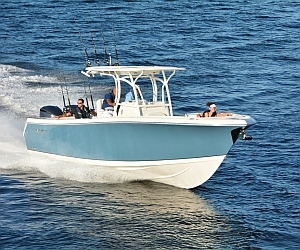 The names may have changed, but they are still being built to the very high standards for which Sailfish Boats are known. 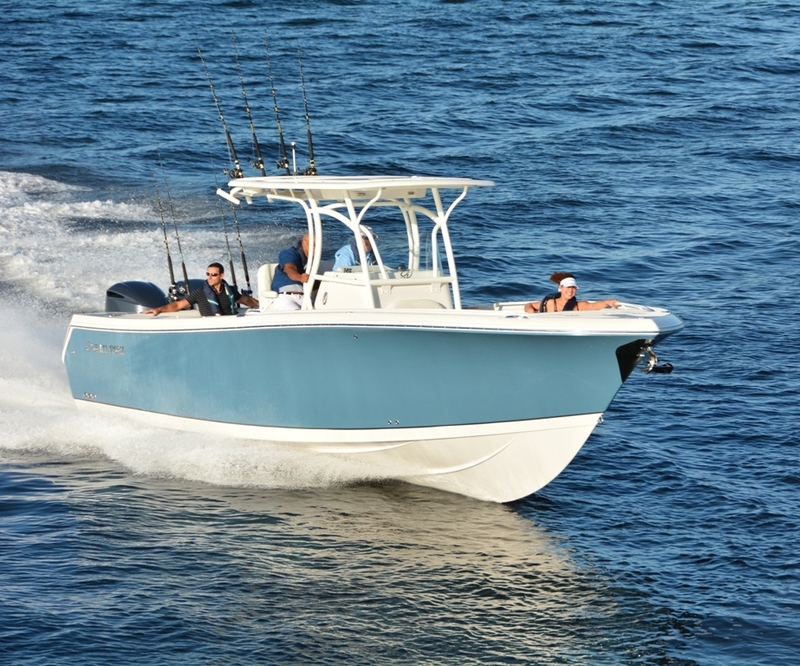 Sailfish Boats and Smith Marine Design have worked together since 2004 and we are still working together today!